Every stage in life has its own beauty. A woman of 50 years may not try to t recover her teenager days’ glow, but she would definitely want to look 10 years younger. In that case, arresting the age at that stage is very crucial as gray hair, wrinkles, dark circles, sun spot and loosening of skin happen. Obesity and various metabolic disorders disturb the inner beauty. 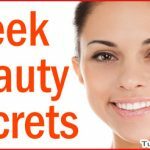 However, 50-year-old women may try these tips described below for maintaining their beauty. 1. Due to the presence of adequate amounts of vitamin A and E, olive oil can be a good fighter against skin damage. 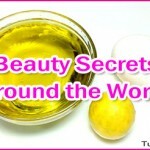 With the application of olive oil on a regular basis, the skin will get proper moisturizer. It repairs and regenerates the skin cells to reduce wrinkles and fine lines. 2. A 50-year-old woman has a tendency to have dark circles around the eyes. The bleaching properties of raw potato can eliminate the patches magically. 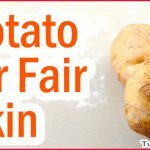 So, you can apply potato juice by slicing the raw potato and rubbing it on the dark circles. 3. 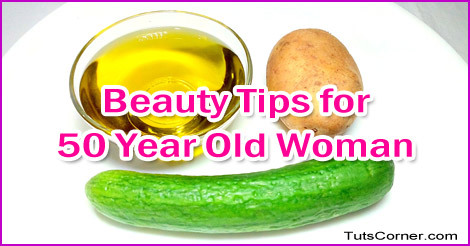 Sagging or loosening skin is another problematic factor which can be prevented by applying cucumber. Grind a cucumber to make a paste. Apply thoroughly on the face. Let it dry up and then wash off with plain water. Besides tightening the skin, it will prevent crow’s feet, wrinkles and dark circles as well. 4. The body tends to accumulate fat around middle age. So you have to be very cautious about obesity. Drink warm water with lemon juice on an empty stomach on a regular basis. 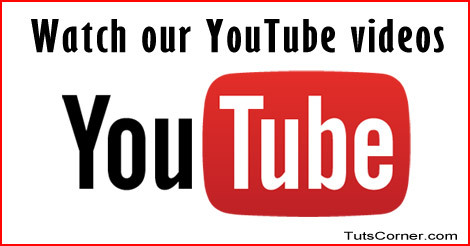 It will clear your bowel and eliminate fat through feces. Plus, you will get vitamin C through lemon juice. 5. Drink adequate amount of water every day. You require 6 to 8 glasses of water. It hydrates the skin, which is essential for a glowing and flawless skin. By drinking sufficient quantity of water and through regular diet and activity, harmful toxins which accumulate in the body can be flushed out from the body. It is needless to say that a healthy body is reflected through the skin. 6. Prepare an anti-aging and antioxidant-rich tea with green tea and dried ginger powder and consume every day. 7. Make an anti-aging face pack by mixing mashed banana with 1 tsp each of honey and rose water. Apply on face and neck. Wash after 20 minutes. Repeat occasionally to reduce signs of aging. 8. Mix ½ tsp of turmeric powder with 2 tsp of curd (yogurt) and apply on your face and neck. Wash after 20 minutes using lukewarm water. Repeat occasionally to reduce wrinkles. 9. 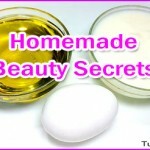 Apply beaten egg mixed with yogurt (curd) on scalp and hair to treat damaged hair. It will also promote healthy hair growth. 10. Consume nuts like walnuts, almonds and cashew nuts as they contain omega-3 fatty acids and zinc which will help to keep your hair healthy.